To receive optimal results purchase a HydraFacial MD Treatment Membership! HydraFacial MD is the only hydradermabrasion treatment that combines cleansing, exfoliation, extraction, hydration – leaving your skin nourished and radiant. This effective treatment delivers results three levels greater than microdermabrasion and two levels greater than IPL laser treatments. It is soothing, refreshing and non-irritating and is immediately effective in reducing fine lines and wrinkles and treating congested and enlarged pores. You may put on makeup and return to your normal activities since there is no downtime! Designed for all skin types and is ideal for oily or acne-prone skin, dry and dehydrated skin, Rosacea, hyperpigmentation, brown spots and redness due to irritation. For best results, a series of treatments for four weeks is recommended. INCLUDES: Vortex Fusion of antioxidants, peptides and hyaluronic acid. This Hydrafacial focuses on removal of dead skin cells , extractions, and penetration of the epidermis with blue LED lights helps to improve the appearance of oily and congested skin, fighting against future break outs. The red LED light is used for inflamed, and irritated skin; great for treating adolescent skin, hyper-pigmentation, Rosacea, fine lines and improving circulation. Lymphatic drainage is performed to increase circulation and remove toxins. Ingredients such as glucosamine, lactic acid, salicylic acid, and glycolic acid are used to remove oil and dead skin cells. Vortex Fusion penetrates Vitamin A, Vitamin E, horse chestnut extract, white tea extract, peptides, and hyaluronic acid into the skin. A perfect treatment for those struggling with back acne or congestion. The Deluxe HydraFacial MD is enhanced with Dermabuilder, Lymphatic Drainage, and LED light therapy. Lymphatic Drainage is a very gentle yet powerful technique which not only helps to detoxify the skin, but also reduces under eye puffiness and helps improve circulation. LED light therapy delivers anti-aging and anti-bacterial benefits improving the appearance of sun-damaged and acne-prone skin. The red LED light aids in circulation, while reducing the signs of aging by stimulating collagen and elastin. The blue LED light improves the appearance of oily and congested skin. The treatment is completed with a pampered face, scalp, neck, décolletage and shoulder massage. HyrdaFacial treatments are fabulous the day of your event, and it will leave your skin glowing, hydrated, relaxed and refreshed! CTGF (Growth Factor Treatment) | $80 Peptides improve elastin and collagen for a smoother, firmer skin appearance. Reduces fine lines and wrinkles. This state-of-the-art technology was developed in Italy and is FDA approved as a non-invasive treatment for the skin. Brighter, clearer and more evenly toned skin is waiting for you in as little as four to six treatments. Over time, this repeated process stimulates the production of a new layer of skin cells, bringing with it an increased level of collagen and elastin, which further improves your skin’s appearance. Microdermabrasion is the leading non-surgical method to help reduce the appearance of fine lines, wrinkles, sun-damaged skin, acne scars, age spots, and stretch marks as well as reduce the appearance of surgical scars. Diamonds are a girl’s best friend, but also their best beauty secret! Wet Diamond Microderm peels away dead skin and reduces wrinkles, acne scars and brown spots. The diamond encrusted wand vacuums the skin resulting in more even abrasion without the gritty residue of crystals. This treatment leaves your skin looking and feeling soft, supple and youthful. Firms, refines and calms your skin with absolutely no downtime. Gentle red/infrared lights decrease inflammation and boost your skin’s collagen and elastin. Recommended for rosacea, fine lines, wrinkles, sun damage, anti-aging, hyperpigmentation, collagen stimulation and irregular skin texture. Blue light therapy is best for acne treatment as it targets the skin molecules that cause acne bacteria. In turn, the molecules produce free radicals which destroy the bacteria. This is an ideal therapy for those who do not respond well to antibiotics. The most advanced technology for skin rejuvenation and delay of skin aging! 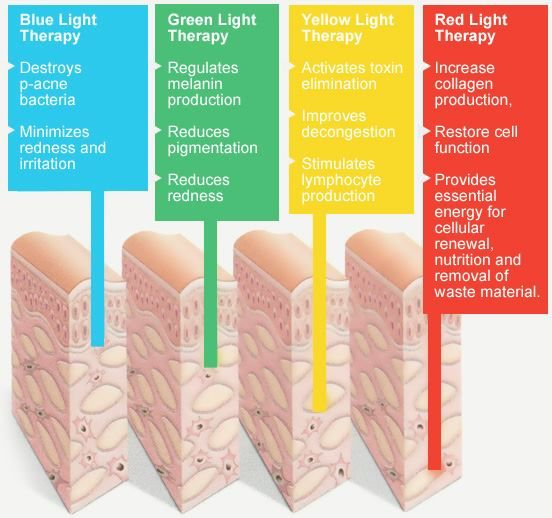 LED Light Therapy uses specific wave lengths of pure spectrum colors- blue, green, yellow, red. Each color has a unique and direct impact on the cells responsible for certain skin conditions such as acne, rosacea, sun-damaged and uneven pigmentation. At the end of the treatment, antioxidants are infused into your skin. The treatments are comfortable, absolutely pain free, and are without any side effects. A series of six treatments is recommended for best results. An alternative to plastic surgery with immediate results and no downtime! LED Light Therapy works simultaneously with Micro-currents emitted from electrodes to firm and tone sagging muscles and strengthen the skin’s foundation. Pore size is reduced and skin texture is improved. Results are noticeable after just one treatment. LumiLIft penetrates the dermis stimulating increased collagen production, thus rejuvenating aged skin tissue, lifting muscles and erasing years. Neck, chest and hands can also benefit from treatments. Exceptional results can be obtained after a series of six treatments to increase collagen, soften the appearance of wrinkles and improve overall skin texture. Best results are achieved with a series of three consecutive treatments. Give your skin a brighter, more youthful complexion! This four step revolutionary treatment includes cleansing, peeling, lifting and toning. The Ultrasonic Facial rejuvenates your skin with ultrasonic technology to effectively exfoliate and then penetrating antioxidants are used to nourish the skin. For best results, a series of three treatments is recommended to improve tone and radiance of the skin.